i'll throw my 2 cents in. yesterday i looked and my drivers side had water in it and a bit of corrosion. my solution was to glue a 4.5" diameter plastic plate over the top with RTV to keep water out of any area of the shock tower. this mounts at an angle so the water just runs off into the rain drain that is around the shock tower anyway. i had a sheet of about 1/16 plastic sitting around which is stiff enough to hold shape on it's own and i used metal shears to cut a 4.5" disc for driver and passenger side. i first sprayed the nut/stud down with some rustoleum paint to keep existing corrossion at bay. should keep water out of the whole area as long as it doesn't pop off on it's own. I just bought a 2017 Leaf and rusting of these bolts would definitely be something I want to prevent. 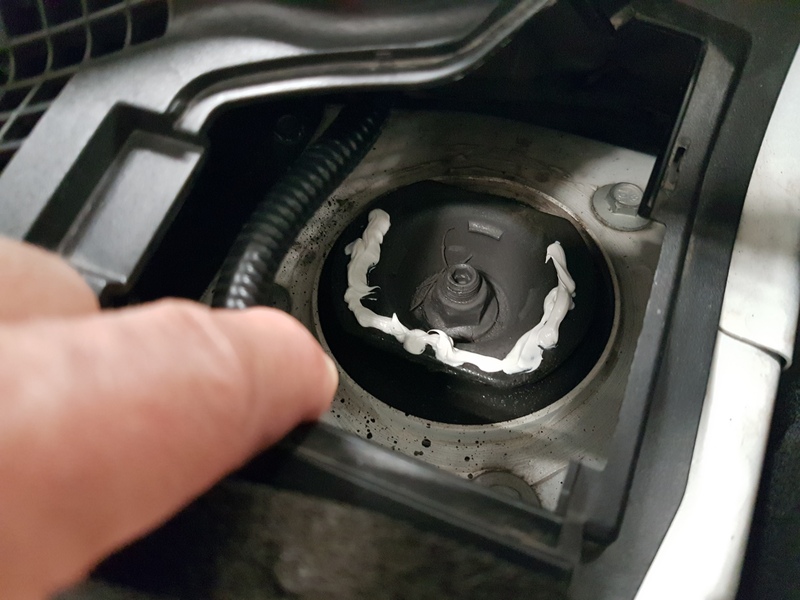 It looks like the common solution is to cover it with grease and a plastic cover, but as an alternative does anyone think spraying the area with Plastidip or Flexidip rubberized coating would work instead? that would probably fix it 95-100%. 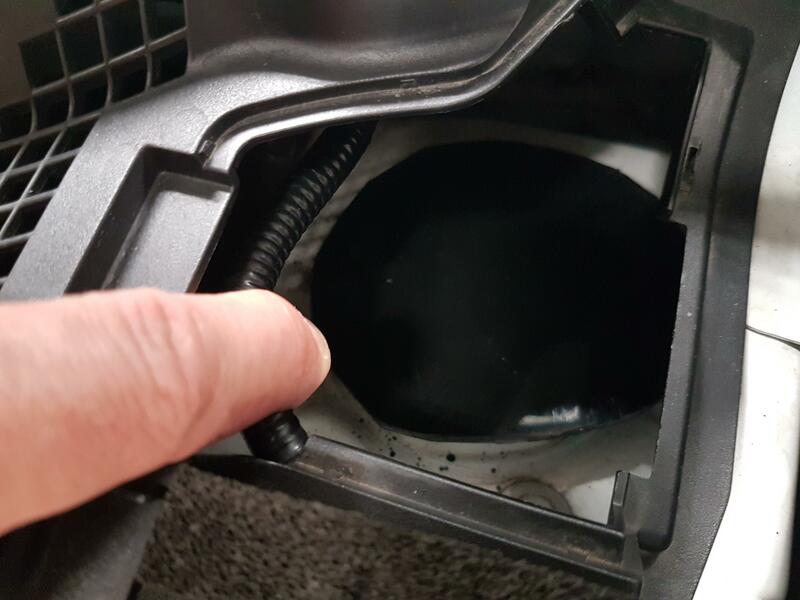 the 5% variability comes from the fact that water still drains into that hole from the wiper and you cant guarantee that the flexidip won't let water seep through at some point and slowly start rusting the bolt from underneath where you can't see it. if you have it around, then spray that on first, as that will take most of the issue away. then later put in a fix that doesn't let water sit in that pool. I just popped off the plastic grates under the hood and saw what you described. We had a thunderstorm earlier and the two wells were full of water. No rust at this time, but the car was only built in May so I'm glad there was none. I agree that flexidip may not be a 100% solution since water will still sit in the well... any pinhole will hide the rusting. Instead I fashioned a plastic hood from a small sheet of clear plastic from a strawberry container, bending the edges to hold around the outside. I wanted it clear so I can check inside without having to remove it. rodenti wrote: Thanks for the reply Marko. Just did mine like estomax above. Used a cut down 4" drain cap from plumbing dept at Home depot . I have never found water in the passenger side on my 13 or 16. Has anybody checked with a dealer on what nIssan's thinking on this is on 2018s? Looking through parts drawings, up to 2917 they at leats had that cap with a hole in the middle, but they removed it in 2018s. They were actually dropped after the 2013 model year, neither my 2014 S nor my 2016 SL had them. I purchased the old Nissan part myself and installed them after cleaning the bolts and spraying them down with some protectant. Last edited by bitmanEV on Wed Sep 26, 2018 11:48 am, edited 1 time in total. Stock NIssan caps (954330-ED000) with vent holes covered by some surplus GoreTex vent stickers I had laying around.